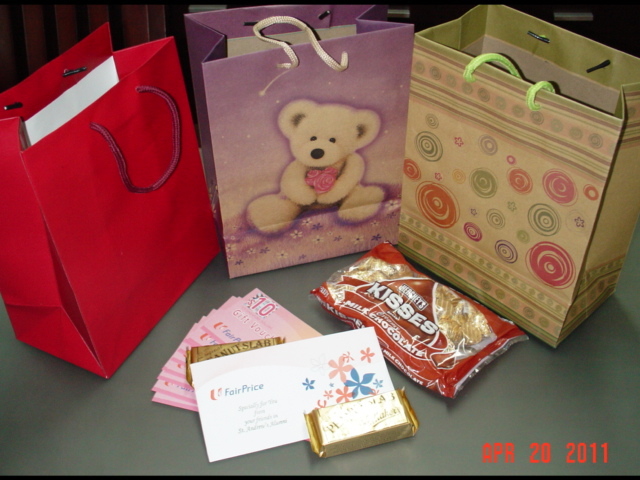 The Saint Andrew’s “GIFT FROM THE HEART FOR EASTER 2011” is a fund proposed by the Saint Andrew’s Alumni (SAA) as a platform to distribute gifts for the students in the Financial Assistance Scheme (FAS) in St. Andrew’s Village. A 217g Pkt of Hershey’s Kisses Milk Chocs and some Whitaker’s Peanut Slabs. These humble gifts will go to 53 families in SAJS, 83 in SASS & 54 in SAJC. The overall aim for the SAA was to raise $19,000 for the fund and I’m aiming to raise $3000 through my network, and so far, $1000 has been raised in an earlier collection. A further $300 had been pledged since last night! To reach $3000, I need 40 more Saints (old boys and girls) to donate at least $50 each by 27th April 2011. Please contact me, and send your contributions to “St Andrew’s Alumni”, 1 Francis Thomas Drive, 01-10, Singapore 359340.